Remember When Bernal Hill Was Naked and Treeless? Recently, when Bernalwood mentioned a proposal to add streetscape trees to our southern stretch of Mission Street around College Hill, we mentioned in passing that it wasn’t all that long ago when most San Francisco streets and open spaces were barren and treeless. Take a close look at the view from Bernal Hill 1969, for example, and you’ll notice that Folsom Street is missing the graceful, willowy trees that now do so much to define its character. Likewise, the photo shown above is a view of Bernal Hill taken at about the same time, and it allows us to visualize how awkward our hill looked before all the trees were planted around Sutrito Tower. 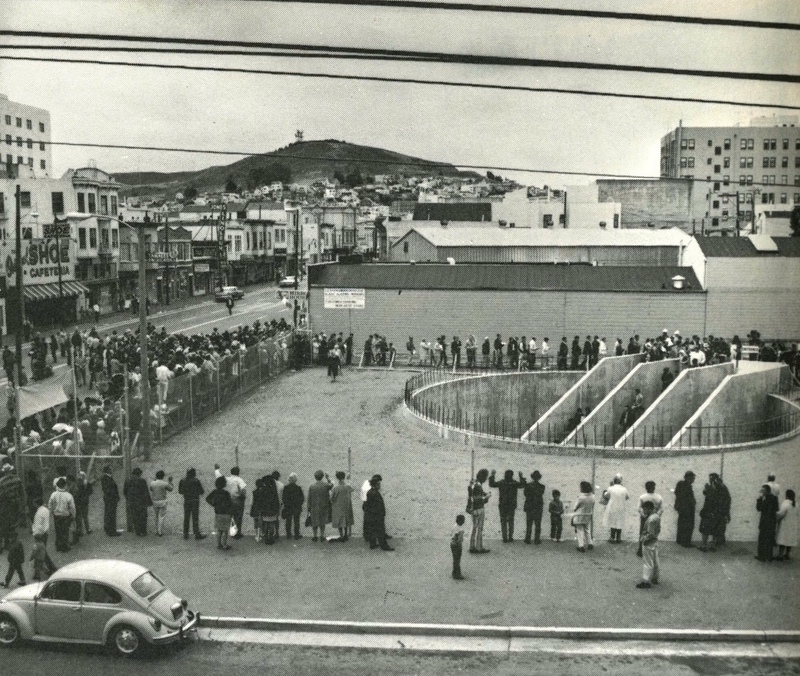 The scene in today’s photo is a special day in August, 1970 when Mission District neighbors were invited to take a sneak peek at the just-completed, but not-yet-open 24th Street BART station. The long lines reflect the intense curiosity that surrounded the opening of BART after many unpleasant years of cut-and-cover construction chaos and disruption along Mission Street. Ah-HA! Upon closer inspection, it looks as if the big trees that now pair so gracefully with Sutrito Tower were actually present at the time, though just-planted. So in this photo we see the genesis of today’s glamorous Bernal Hill beautification, at the very moment when the trees were just taking root. Hurrah! We’re sure a few Bernalwood readers had a hand in that tree-planting, so hopefully they’ll tell us more about how that happened in the comments. The Shoe Cafeteria?? Shoes??? As food??? Presumably served in a wide range of styles, with various a-la-carte sauces? Ugh. Goddamn hipsters, ruining the Mission — even back then. yes, i think i remember Shoe Cafeteria but am not sure of the location and i don’t think it’s mentioned here. looks like the sign nearby says Tamales. when i arrived here in 1968 BART construction had Mission Street covered with wooden beams and it was all i could do to bring my car to a stop in the rain. remember rain? in fact got rear-ended there. i also remember La Morena (?) tortilla factory, a bakery near or at where Walgreen’s is now at 30th and Mission and my beloved rented earthquake cottage on unpaved Montcalm Street before, like the rest of this poor city, it was invaded and destroyed by $peculators$. The Shoe Cafeteria is now the Foot Locker. Impressive that those tress have grown so large in such a short period for being on such a windy point. I think you can probably credit the trees to the 1968 Bernal Heights Neighborhood Improvement Program. 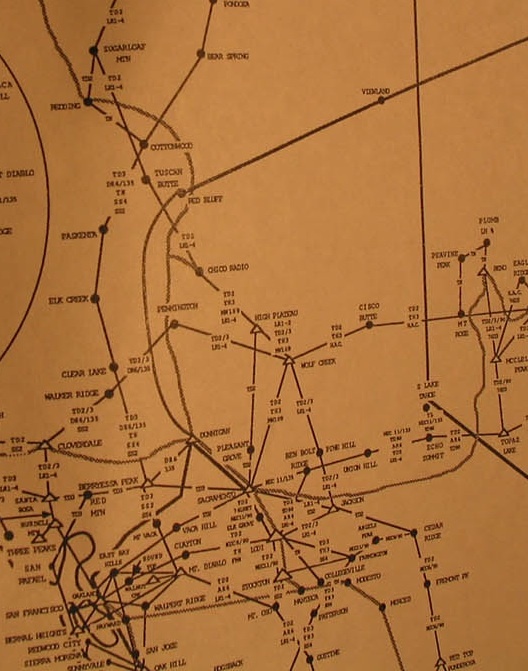 Sorry I don’t have the full text, but here are the maps and a summary. Typical of a California grassland, the hill is covered in glorious wildflowers in spring. Our Mediterranean climate means it’s fairly dormant in the summer dry season (which is indeed longer in the greater drought we’re currently experiencing), but even now, a few days from summer, it’s dotted with Ithuriel’s spears, particularly along the north and west sides. Lots of our local morning glory, buckwheat and deerplant are currently blooming on the south side. It’s never been naked or barren. You just have to look for our charismatic micro-flora and wildlife. The gopher snakes, alligator lizards, Swallowtail, acmon blue and buckeye butterflies, barn swallows, finches et al love that open grassland. The red-tailed hawks nest in the eucs on the north side below the road, but they wouldn’t bother if there weren’t open land nearby for them to hunt gophers, voles and snakes. That’s a California grassland: Altered by the grazing period, but still supporting a rich and unique flora and fauna. I can confirm alligator lizard sightings—size XL—deep in the Bernal backcountry. Also California newts—coated with contact poison—were spotted via flashlight in the years gophers were digging tunnels for them. San Francisco was treeless when the conquistadores arrived. Not lifeless. I love the Ithuriel’s spear. I tried to get some to grow from seed this year but without any success. Next year, maybe! Perhaps the trees were meant to screen the radio equipment that was on top of the hill. I believe the electronics are gone but we’re still left with those trees. Thanks for the detail about our grass covered open space. You’re right, Eugenie! That was the purpose of the plantings inside the radio tower. There are still dozens of radio devices inside that compound. Some are used for our city emergency services. Some serve private businesses. You have to respect their culture, which you simply cannot understand. They have been oppressed since the Devonian. You never miss an opportunity to “zoom and enhance”, hilarious. I love historical posts. Apparently it took longer than Pacific Bell expected in 1962 for Ugly Hill to Be Beautified. The microwave network that Bernal connected to was quite impressive. Also, Bernal as seen from Mt. Diablo. My sister moved to SF near 16th and Mission (Rondel Place, specifically) in the very early seventies and I wish I had a sense of what it was like. I visited often (and lived with her awhile, when she was near 25th/Treat) throughout the seventies and eighties but as sometimes happens in places we see over a long period of time, rather than leave and come back to, I don’t have a sense of the change over time. 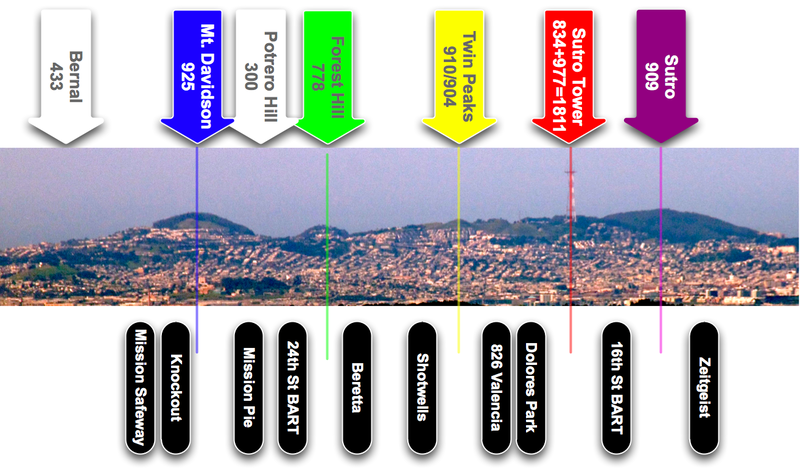 I don’t remember what Bernal Hill was like, or where trees were. Eric has a superpower.